Innovative image analysis software that creates a 3D model of the heart and could prevent up to 35,000 patients a year undergoing invasive tests will be fast-tracked into use by the NHS through the Innovation and Technology Payment (ITP) programme. A surgical suture that reduces the risk of infections like MRSA will also join the NHS scheme to help patients benefit from world leading innovations. 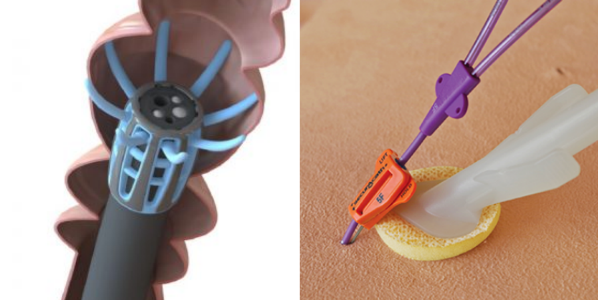 A new type of ‘bowel scope’ and a device that cuts infections caused by catheters (both pictured above) complete the four innovations that will be fast-tracked into use through NHS England’s ITP programme. The NHS’ own ‘innovation agencies’ – the 15 Academic Health Science Networks (AHSNs) across England – will be responsible for accelerating uptake locally. The scheme delivers improvements in patient care by cutting bureaucracy for clinicians and other innovators and encouraging uptake through the NHS. Simon Stevens, Chief Executive of NHS England, said: “From the very beginning the NHS has been at the forefront of driving innovation, as we celebrate the NHS’s 70th birthday the NHS continues to champion innovation. Advanced image analysis software that creates a 3D model of the coronary arteries and analyses the impact that blockages have on blood flow to rapidly diagnose patients with suspected coronary artery disease. The use of the device can avoid the need for invasive investigations such as coronary angiography, usually carried out under local anaesthetic, where a catheter is passed through the blood vessels to the heart to release a dye before X-rays are taken. NICE estimate up to 35,000 people per year could be eligible. Find out more. A new type of surgical suture – stitching – that reduces the rate of surgery-linked infection (surgical site infection) such as MRSA, through the use of antimicrobial suture packs. There were 823 cases of MRSA reported in the NHS in 2016/17. Find out more. A new type of ‘bowel scope’ that improves colorectal examination for patients undergoing bowel cancer tests. Bowel cancer is the fourth most common cancer in England with 34,000 people diagnosed each year. For every 1,000 people screened for cancer, it is estimated that six cases could be avoided thanks to early detection through the use of this device. Find out more. A device to secure catheters that reduces the infection risk for patients with a peripherally inserted central catheter. The use of this equipment helps to reduce the time taken to care and treat dressing changes. This type of catheter is normally used in people needing intravenous access for several weeks or months in both inpatient and outpatient settings. NICE estimate up to 120,000 people per year could be eligible. Find out more. This is the second year of the drive to identify and fast track specific innovations into the NHS, which has already benefitted 75,000 patients. More information on existing programmes click here.